Purpose: To provide empirical evidence on key organizing constructs shaping practical, real-world integration of behavior health and primary care to comprehensively address patients' medical, emotional, and behavioral health needs. Methods: In a comparative case study using an immersion-crystallization approach, a multidisciplinary team analyzed data from observations of practice operations, interviews, and surveys of practice members, and implementation diaries. Practices were drawn from 2 studies of practices attempting to integrate behavioral health and primary care: Advancing Care Together, a demonstration project of 11 practices located in Colorado, and the Integration Workforce Study, a study of 8 practices across the United States. Results: We identified 5 key organizing constructs influencing integration of primary care and behavioral health: 1) Integration REACH (the extent to which the integration program was delivered to the identified target population), 2) establishment of continuum of care pathways addressing the location of care across the range of patient's severity of illness, 3) approach to patient transitions: referrals or warm handoffs, 4) location of the integration workforce, and 5) participants' mental model for integration. These constructs intertwine within an organization's historic and social context to produce locally adapted approaches to integrating care. Contextual factors, particularly practice type, influenced whether specialty mental health and substance use services were colocated within an organization. Conclusion: Interaction among 5 organizing constructs and practice context produces diverse expressions of integrated care. These constructs provide a framework for understanding how primary care and behavioral health services can be integrated in routine practice. In addition to policy changes, there is strong evidence that patient experience and outcomes improve and costs are contained when behavioral and medical problems are addressed together.4⇓⇓⇓–8 However, integration has not been consistently adopted in health care systems across the country.9 Although the research has been robust around the benefits of integration, the vast majority of it has been disease specific or focused on select populations.10,11 In primary care settings, patients often present with multiple chronic conditions and have behavioral health needs that may far exceed a particular disease.12 To this end, 1 of the most important remaining problems is how to integrate primary care and behavioral health within the current fragmented health system and with primary care practices that are constantly being asked to change.1,13,14 We use the term integration approach to refer to the constellation of elements that shape how practices organize and deliver integrated care. An integration approach brings together the structures and processes that make integration possible. This study was undertaken to understand how a diverse sample of practices integrate behavioral health care and primary care. In a comparison we attempted to elucidate the organizing constructs and constellation of factors that influence real-world practices' attempts to integrate care. We studied 19 practices located in the United States, and purposefully sampled for their diversity and efforts to integrate behavioral health and primary care. Eleven practices participated in the Advancing Care Together (ACT) program funded by The Colorado Health Foundation. A Steering Committee of local and national leaders in integration selected practices applying to participate in a study of their attempts at integration. ACT practices varied in their experience with integrated care, but most were integrating behavioral health and primary care for the first time. Eight practices participated in the Integration Workforce Study (IWS) to identify workforce needs for integrated care. This work was funded by the Agency for Health care Research and Quality (AHRQ), with supplemental funding from the CalMHSA Foundation and Maine Health Access Foundation. For this study, an Expert Panel composed of national leaders in integration identified practices known to be integrating care. We used this information to identify practices with variation in organizational structure and geographic location, and conducted interviews with select leaders at each organization to identify practices with the strongest integration programs in each region. None of the study practices were directed to implement any particular integration intervention, strategy, or approach. ACT was a longitudinal study designed to observe practices as they implemented their programs over a 3-year study period (September 1, 2011 to August 31, 2014). IWS was a cross-sectional study, and we conducted 1 data collection site visit at each practice between December 2012 and October 2013. The same team of researchers worked on both studies. Details regarding data collection for ACT and IWS are reported elsewhere.15,16 Table 1 provides additional details about data collection process for this study. Online diary data were collected among ACT practices only because this data collection method was designed to understand and prospectively collect implementation experiences. We also assessed implementation REACH; defined as the proportion of patients in the intended target population that received integration.17 Because it was not feasible to directly assess REACH with patient-level data among IWS sites, we used qualitative data from practice observation to assess REACH in both ACT and IWS practices. We defined the practice's target population as all the patients in the practice. For primary care practices, we defined “broad reach” as evidence of consistent involvement of behavioral health clinicians (BHCs) in a broad range of primary care services (eg, depression, anxiety, diabetes, blood pressure management), and “limited reach” as consistent evidence that BHCs were involved in patient care for only a fraction of the practice population. For Community Mental Health Centers (CMHCs) these definitions were the same, but applied to the primary care clinicians (PCCs). Practice survey data were transferred to Excel and entered into SPSS for data analysis. Interviews were audio recorded and professionally transcribed then reviewed for accuracy and deidentified. Qualitative data were put into Atlas.ti (Version 7.0, Atlas.ti Scientific Software Development GmbH, Berlin, Germany) a program for qualitative data management and analysis. Institutional Review Boards at Oregon Health & Science University and the University of Colorado–Denver approved this study. We used a grounded theory approach to analyze data, informed by the work of Miller and Crabtree18 and Borkan.19 A multidisciplinary team read and discussed data, as they were collected, tagging important sections of text, and naming them (eg, screening, brief counseling) so text could be retrieved, clustered, and further analyzed. When we reanalyzed the data, we identified a small number of crosscutting organizing constructs that distinguished integration approaches. We identified as many nonduplicative discrete constructs as possible, established conceptual and operational definitions for each construct, and used both qualitative and quantitative data to categorize practices on constructs. Where there was uncertainty, we went back to the data or to a practice participant to clarify interpretations. Through this iterative process, we reached thematic saturation, as no new organizing constructs emerged through data analysis. We then developed a matrix characterizing practices by organizing constructs, and along with other qualitative data, used this to identify and understand interconnections among organizing constructs and the implications for delivery of integrated care. We call these organizing constructs because they were central to the integration efforts we observed in real-world practices, and variation in these constructs allowed us to discriminate among practices with regard to integration. Table 2 includes conceptual and operational definitions of the organizing constructs. Characteristics of the 19 practices we studied are presented in Table 3. Twelve were primary care practices representing a range of practice types and ownership; the others were mental health care practices. Table 4 provides a description of the integration approach at each practice. Below, we describe salient aspects of each organizing construct observed across practices and exemplify how constructs intertwine with each other and with contextual factors, such as practice type, to influence practices' integration efforts. Practices choosing to systematically screen patients wanted: 1) routinized, reliable processes for identifying need; 2) to understand the needs of the population they served; and 3) data to develop and refine their integration approach. Practices relying on clinical discretion did so because of: 1) uncertainty about the sustainability of the integrated approach, 2) a perceived lack of capacity to address population need should systematic screening be employed, 3) a focus on careful resource management; and 4) inertia (the ease of doing things as they have always been done). Practices were challenged to determine the level of patient need that could be addressed within the practice, and to recognize patients whose care was best left to others, often outside of the practice. Practices fell into three categories based on how they organized care for integration across the range of patients' severity of illness: 1) practices providing care for patients with mild to moderate illness in the practice, and referring specialty and long-term care needs out to other organizations; 2) practices providing care for mild to moderate illness in the practice, and referring patients to specialty resources in house either in the practice, or within the system; and 3) practices that cared for patients with mild to moderate and more severe illness in the practice, in part because they did not have strong ties with external organizations for referral. In addition, PCCs and BHCs sometimes consulted with psychiatrists to support patient care, even for patients with mild to moderate needs, particularly when help was needed with diagnoses or medication management.22 Access to a consulting psychiatrist could help keep the care of moderate to higher-need patients in the practice. Table 3 shows the majority of federally qualified health centers (FQHCs), FQHC-CMHCs, CMHC, and health system, government and hospital-owned practices were able to establish access to a consulting psychiatrist, and most privately owned primary care practices were not. When organizing care for patients with more specialized, long-term needs, practices needed access to specialty mental health and substance use services (see Table 3). The majority of independent primary care practices, regardless of size, established relationships with organizations providing these services, but did not have colocated access to specialty mental health. In contrast, FQHC-CMHC hybrid organizations, as well as hospital and government-owned practices, had colocated services for specialty mental health, with clinicians located in other buildings on the same campus, or in another part of the same building. Being in the same system could have advantages for tracking patient engagement in services, information sharing, and followup, as clinicians in these systems had a single shared medical record, although systems did not always take advantage of this level of interconnectivity. In addition, in crisis situations, specialty services could be rapidly engaged. Referral was the method used by practices for engaging patients in specialty services, regardless of service location. A referral is when a patient is directed to make an appointment with another professional (patients may or may not receive scheduling assistance). When organizing care for patients experiencing mild to moderate problems (eg, mild to moderate depression or anxiety; common acute illnesses, mild to moderate chronic disease), practices colocated needed professionals (ie, BHC in primary care practice; PCC in community mental health) to help patients address these needs. When another health care professional was engaged in the care of patients with mild to moderate needs, this transition occurred either through referral or warm handoff. A warm handoff is when a clinician directly introduces a patient to another clinician at the time of the patient's visit, and often a brief encounter between the patient and the health care professional occurs.23⇓–25 When organizing care for patients with mild to moderate problems, 6 practices used warm handoffs. Table 5 shows a subset of practices employing multiple, full-time PCCs and BHCs with relatively robust financing models for their integration efforts (eg, FQHC, FQHQ-CMHC, hospital systems). Practices 2, 3, 4, and 5 had a shared mental model for integration, meaning that they shared an understanding of the practice's vision and approach to integrating care for patients. This included a systematic approach to identifying patient need for integration, brief, problem-focused therapy offered in the practice, adequate resources to establish clear pathways for patients with specialty mental health and substance use needs, and BHCs embedded on PCCs teams. Importantly, BHCs and PCCs were also located in close proximity to each other and routinely engaged in warm handoffs in these practices.26 This constellation of constructs led to a broad reach of integrated services among the patient population. In contrast, practice 1 (also shown in Table 5) did not engage in warm handoffs between primary care and behavioral health, and a referral approach emerged. Constructs that intertwined to contribute to this integration approach included PCCs and BHCs separated by physical distance (ie, on different floors of the building), misalignment among practice members on how best to deliver integrated care despite leadership's vision for more collaboration among PCCs and BHCs, and BHCs who were more comfortable in a traditional therapeutic model. It is important to note that this practice employed systematic screening, but the integration program did not have broad reach because of these issues. The organizing constructs described above also apply to CMHCs that are colocating a primary care team. In addition, we found that CMHCs, particularly those trying to redefine their organization's identity to one serving a community of patients with a range of integrated health care needs, not just serious and persistent mental illness, needed to consider how to care for patients with specialized medical needs, for patients with mild to moderate emotional and behavioral needs, as this had not previously been the focus of their practice, and needed to establish how PCCs and traditional mental health professionals would collaborate in this newly envisioned organization. 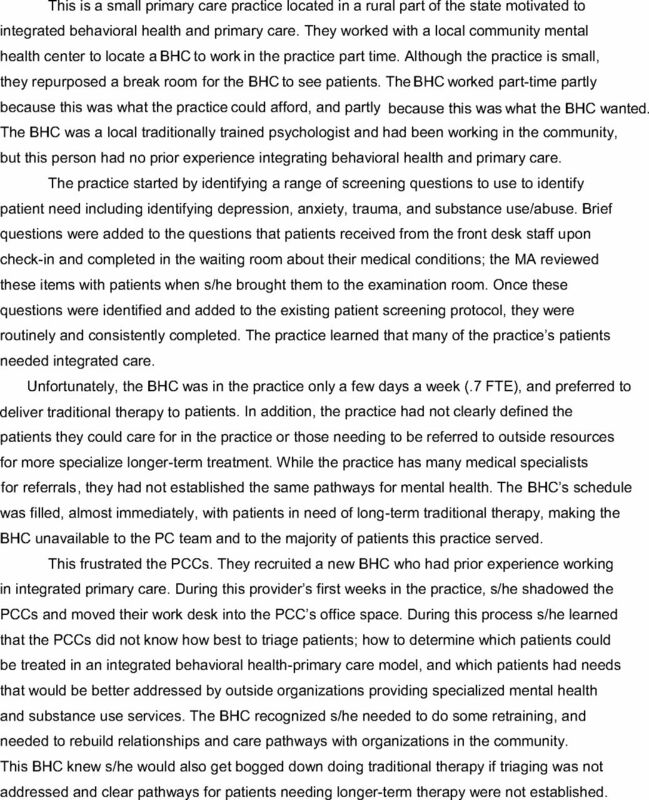 Interestingly, 1 practice transitioned a mental health clinician to function as an embedded BHC consultant on the newly embedded primary care team. The constructs we identified are highly interdependent, and the ways in which they intertwine shape practices' approach to integration. How these constructs come together is influenced by the context in which an organization is embedded (eg, state based policies, payment). Figure 1 presents an illustrative case study showing how, when appropriate identification of patient need and triaging did not happen, BHCs' accessibility to the primary care team is reduced. In this case study, this was a self-reinforcing cycle. PCCs did not know how to triage patients, the practice had not established care pathways for patients with longer-term behavioral health needs, and the BHC was traditionally trained with a preference for engaging patients in traditional therapy, and an inability to establish triage strategies and care pathways. Thus, although this practice aspired to fully integrate care for all practice patients, the result was a colocated, referral approach with capacity to systematically screen patients to identify need but a limited capacity to meet the needs of patients for integrated care. A case study demonstrating how the five organizing constructs intertwine to shape a practice's integration approach. Through careful observation of diverse practices in diverse settings, we found 5 organizing constructs underlying varying integration approaches. These 5 organizing constructs—integration reach, development of care pathways, approach to care transitions, location of integration workforce, and shared mental model for integration—intertwined with practice context to produce the integration approaches we observed in real-world practices across the United States, and had implications for delivery of patient care in these settings. Contextual factors, particularly practice type (eg, FQHC, CMHC), influenced whether specialty mental health and substance use services were colocated within an organization. FQHC-CMHC hybrids had these services colocated within their building, integrated and hospital-owned health systems often had these service colocated within their facility or campus, and FQHCs and independent practices tended to connect with external community resources to access these services for their patients. Our findings show that practices that colocated the full spectrum of behavioral health resources and used warm handoffs to transition patients to embedded behavioral health relied on referrals for specialty mental health needs. The practices we studied did not fit neatly into the integration model typology (ie, coordination, colocation, integration) that has been central to shaping this field.27⇓–29 Care pathways and, in particular, whether practices used warm handoff or referral approaches, are a good example because practices could use both for good reason and to good effect. As more practices move toward integrating care, there is likely to be an increasing need to migrate away from some existing heuristics (eg, levels, models),27⇓–29 and sharpen the focus on the particulars in practices' approaches to integration. Models have tremendous relevance in identifying common conceptual elements or behaviors, and these have led to standardizations critical for unifying the field of integration. Yet, these conceptual and definitional frameworks, such as those the AHRQ Lexicon23 that maintain consistency through definition, cannot be expected to mirror the many nuances emerging among practices integrating care in real-world settings. Our study, because it is grounded in the reality of practice, identifies constructs that complement and extend these frameworks by capturing some of the dynamic forces shaping integration efforts. Rather than offering a prescriptive model organization leaders and change agents attempt to abide by, the constructs identified are relevant to different types of practice settings and represent an organic set of issues that can be, and must be, addressed as practices configure and mature their integration approaches. We identified integration reach, that is, the approach a practice used to identify and meet patient need, as an organizing construct. This construct, and the approaches we saw employed to identify patient need (ie, systematic screening, clinician discretion) has generated much dissent in the research and practice communities.30 To add to this dialog, we suggest that there are pros and cons that must be carefully weighed by organization leaders about how best to identify patient needs. Systematic screening, even if patient need was not immediately met, allowed practices to learn the needs of the population served, and some practices found motivation in this knowledge, working to develop the infrastructure to best serve their patients. Clinical discretion did not provide this information and possible motivation, but was a useful way to manage resources and a temporary way to work out the organization's integration approach without getting overwhelmed by the large number of screen positives that might result from systematic screening approaches. We studied a purposefully selected group of practices motivated to integrate care. This is a study strength because we could not have examined the organization of integration among unmotivated practices not integrating care; it is a limitation given that these practices could be different from less-motivated practices. By establishing a maximum variation sample that widely represented U.S. practices on key attributes, we mitigated this limitation to the extent possible, but the findings apply most closely and relevantly to practices attempting to integrate care. In addition, although we reached saturation in this analysis, it is possible that there are other organizing constructs than those that manifest among our study sample. Having a relatively large and varied study sample gives us confidence that the organizing principles we identified are valid and transferrable. However, it is always possible that future studies will identify other important organizing constructs. The findings of this study could also be shaped by observer and classification biases. For example, we do not have quantitative estimates of REACH for some of the practices we studied, and our assessment is based on qualitative data sources. It is possible factors shaping researchers' preconceptions may have skewed our assessments. This limitation was mitigated by having multiple people in the field, not relying on a single person's assessment, with regard to REACH (or the other study findings), and having both quantitative and qualitative assessments among ACT practices to confirm the validity of our qualitative assessments. Finally, we do not present outcome data for these practices, and do not know the effectiveness of the services they provide. Future efforts should examine the outcomes of the integration approaches emerging in real-world practices. As practices move toward solving the challenge of integrating primary care and behavioral health, policy makers, organizational and practice leaders, and researchers may find it useful to focus their work on these 5 organizing constructs simultaneously: integration REACH, development of care pathways, approach to care transitions, location of integration workforce, and a shared mental model for integration. These constructs are interdependent and intertwine with practice context to produce locally specific integration approaches that affect the care patients receive. Combined with paying attention to relevant contextual factors, they offer practical focal points for organizing and enabling practices to redesign for integrated care. For researchers, the organizing constructs provide an empirically derived framework of potential use in pragmatic trials and further work to develop practice-based evidence relevant to furthering integration efforts. The authors are grateful to the participating practices and their patients. We thank Leah Baruch, MD, for her assistance with data collection on the IWS study and Claire Diener for her assistance formatting tables. The authors are also grateful for editing and publication assistance from Ms. LeNeva Spires, Publications Manager in the Department of Family Medicine at Oregon Health & Science University. Funding: This work is funded by grants from The Colorado Health Foundation, the Agency for Healthcare Research and Quality (8846.01-S01), the CalMHSA Foundation (AWD-131237), and Maine Health Access Foundation (2012FI-0009). KCS's time is supported as a Scholar of The Institute for Integrative Health, and by a Clinical Research Professorship from the American Cancer Society. MD's time is supported by an Agency for Healthcare Research and Quality–funded PCOR K12 award (Award No. 1 K12 HS022981 01). Received for publication February 6, 2015. Revision received May 8, 2015. Accepted for publication May 22, 2015. The Center for Consumer Information & Insurance Oversight. Mental Health Parity and Addiction Equity Act (MHPAEA) 2008. http://cciio.cms.gov/programs/protections/mhpaea/index.html. Accessed December 1, 2012.
. Patient Protection and Affordable Care Act: Promise and peril for primary care. Ann Intern Med. 2010;152(11):742–4.
. Integration of Mental Health/Substance Abuse and Primary Care No. 173 (Prepared by the Minnesota Evidence-Based Practice Center under Contract No. 290–02-0009.) AHRQ Publication No. 09-E003. Rockville, MD: Agency for Healthcare Research and Quality, October 2008.
. Evolving Models of Behavioral Health Integration in Primary Care. Milbank Fund Report, 2010.
. Integrating mental health treatment into the patient-centered medical home (prepared by Mathematica Policy Research under contract No. HHSA290200900019I TO2). Rockville, MD: Agency for Healthcare Research and Quality, 2010.
. Primary care clinicians evaluate integrated and referral models of behavioral health care for older adults: Results from a multisite effectiveness trial (PRISM-e). Ann Fam Med 2004;2:305–9.
. The state of the evidence for integrated behavioral health in primary care. In: Talen MR, Burke Valeras A, eds. Integrated behavioral health in primary care: New York: Springer, 2013;65–98.
. Research and evaluation in the transformation of primary care. Am Psychol 2014;69:430–42.
. A national agenda for research in collaborative care: Papers from the Collaborative Care Research Network Research Development conference. AHRQ publication No. 11-0067. Rockville, MD: Agency for Healthcare Research and Quality, July 2011.
. Outlining the scope of behavioral health practice in integrated primary care: Dispelling the Myth of the one-trick mental health pony. Fam Syst Health. 2014;32:338–44.
. The paradox of the parts and the whole in understanding and improving general practice. Int J Qual Health Care 2002;14:267–8.
. The Triple Aim: Care, health, and cost. Health Aff (Millwood) 2008;27:759–69.
. A guidebook of professional practices for behavioral health and primary care integration: Observations from exemplary sites. Rockville, MD: Agency for Healthcare Research and Quality, March 2015.
. Evaluating the public health impact of health promotion interventions: the RE-AIM framework. Am J Public Health 1999;89:1322–27.
. The dance of interpretation. In: Crabtree BF, Miller WL, eds. Doing qualitative research. 2nd ed. Thousand Oaks, CA: Sage Publications, 1999;127–43.
. Immersion/crystallization. 2nd ed. Thousand Oaks, CA: Sage Publications, 1999.
. Lexicon for behavioral health and primary care integration: Concepts and definitions developed by expert consensus. Rockville, MD: Agency for Healthcare Research and Quality. April, 2013. AHRQ Publication No. 13-IP001-EF.
. REACH of interventions integrating primary care and behavioral health. J Am Board Fam Med 2015;28:S73–S85.
. Building primary care behavioral health systems that work: A compass and a horizon. In: Cummings NA, Cummings JL, Johnson JN, eds. Behavioral health in primary care: A guide for clinical integration. Madison: Psychosocial Press, 1997;37–58.
. The integration of primary care and behavioral health: Type II change in the era of managed care. In: Cummings NA, O'Donohue WT, Hayes S, Follette V, eds. Integrated behavioral healthcare: Positioning mental health practice with medical/surgical practice. New York: Academic Press, 2001;45–70.
. The primary care behavioral health model: Applications to prevention, acute care and chronic condition management. In: Kessler R, Stafford D, eds. Collaborative medicine case studies: Evidence in practice. New York: Springer, 2008.
. Designing clinical space for the delivery of integrated behavioral health and primary care. J Am Board Fam Med 2015;28:S52–S62.
. Integrated primary care: Organizing the evidence. Fam Syst Health 2003;21:121–33.
. Evolving models of behavioral health integration in primary care. New York: Milbank Memorial Fund, 2010.
. Lexicon for behavioral health and primary care integration: Concepts and definitions developed by expert consensus. Publication No. 13-IP001-EF. Rockville, MD: Agency for Healthcare Research and Quality, 2013. Strategies to Support the Integration of Behavioral Health and Primary Care: What Have We Learned Thus Far?